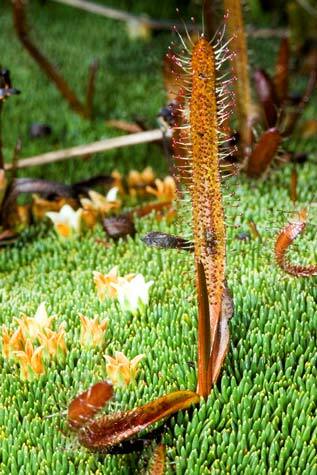 Sundews trap and digest insects on sticky glandular hairs that cover their leaves. The nutrients obtained in this way help them to survive in infertile bogs. This alpine sundew (Drosera arcturi) is growing in the middle of Donatia novae-zelandiae, a common cushion-forming plant.